I’m kickstarting this week’s intraday charts update with a chart pattern + pound double special. And I’ve got a channel on GBP/USD and a triangle on GBP/CAD on today’s menu. GBP/USD has been in a downtrend for several days now. 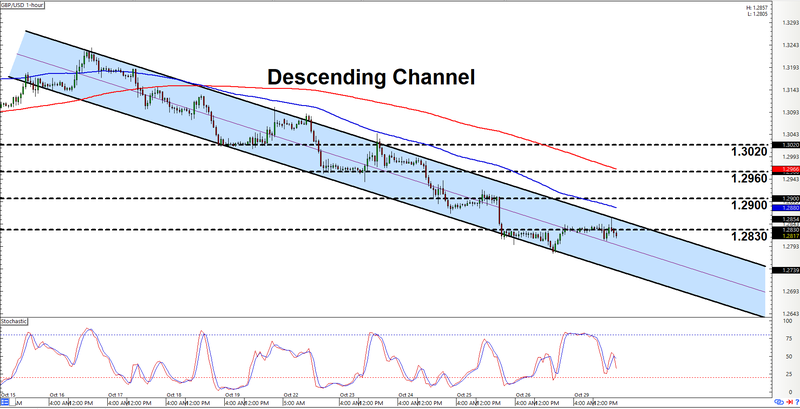 Not only that, the pair has been trending lower while respecting that there descending channel. And presently the pair appears to be finding sellers at the price area at 1.2830, which is just below the channel’s resistance area. Y’all may therefore wanna start lookin’ for opportunities to go short on the pair. But before y’all do that, let me just point out that there’s a possibility that the pair may temporarily break to the topside and test the 1.2900 major psychological level. Such a scenario seems unlikely, though, and everything’s still good if 1.2900 holds as resistance. However, if bullish momentum is strong enough that the pair clears 1.2960, then y’all may wanna think about bailing yo shorts. And if the pair continues moving higher after that and also clears 1.3020, then that would be a very clear signal that bulls are in control. If you’re more of a breakout chartist, then check out that there’s symmetrical triangle on GBP/CAD’s 1-hour chart. 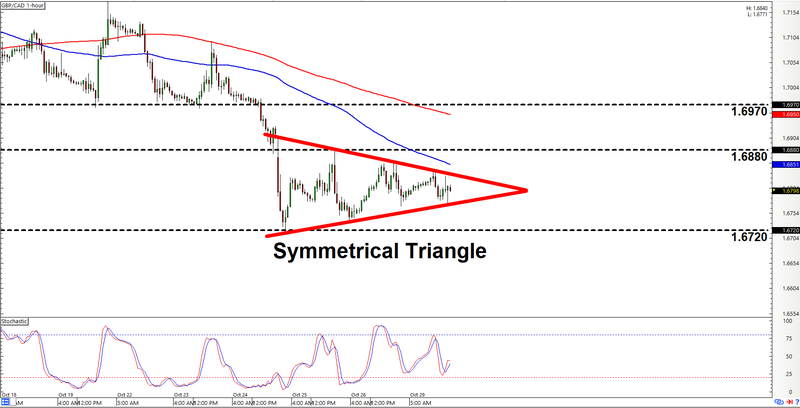 The pair is just as likely to stage an upside breakout as a downside breakout from a symmetrical triangle. We therefore don’t have a strong directional bias on the pair. However, the previous trend before the pair consolidated is a downtrend. Also, them moving averages are still in downtrend mode. Further moves to the downside therefore seem a bit more likely. But again, that there is a symmetrical triangle. It would therefore be prudent for y’all to prepare for both upside and downside scenarios. In any case, just keep in mind that the pair needs to smash lower past 1.6720 in order to validate a downside triangle breakout. A topside breakout, meanwhile, needs to clear 1.6880 in order to confirm a breakout. However, the pair would also need to clear 1.6970 in order to signal a potential trend change. Whichever scenario plays out, y’all just make sure y’all remember to practice proper risk management as always, a’ight?